Quantum Pad is the first educational system designed to make learning fundamental grade school subjects fun and easy. The system is compatible with the Quantum Pad library of books, which is designed to encourage children to learn fundamental grade school skills, explore new topics and master skills related to reading. Each book is packed with interactive audio, games, quizzes and activitites. Includes a 32-page interactive book. 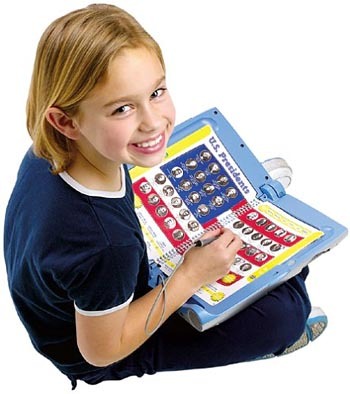 Similar to its LeapPad sibling, this electronic book comes with a permanently attached interactive 'magic pen' that works like a handheld computer mouse pointer. Kids place a paper book and its compatible cartridge into the Quantum Pad, then use the pen to hear word pronunciations and definitions, answer quiz questions, play games, and more. Geared specifically for students, the Quantum Pad comes with one book (others are sold separately) that has a sampling of every subject: math, geography, science, history, and language arts. Also included is a parent guide that explains how to set up the book properly and download additional content. This 15-by-12-inch learning aid shuts like a laptop for better portability, has volume control, and even offers a headphone jack for quiet play. Four AA batteries are required but not included. All LeapPad books are compatible with the Quantum Pad system.